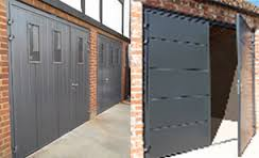 Customers have realised the practicality of side hinged doors for mainly in a situation where the garage door isn't being used for the car (the side hinged garage doors still can be automated). The side hinged garage doors allow easy access to the garage without the need to manually lift the door in the conventional way, and also the side hinged door can be opened one side if needed for easy access. ​Steel side hinged doors are available in three ranges, steel powder coated with a rockwool insulation, or a 42mm panel thickness door foam injected(2 manufacturers). The third available option is made in the same single skin specification as a single skin up and over door, but with the ease of access of the side hinged.